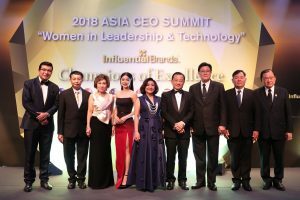 Singapore (Singapore) – November 23, 2018 (travelindex.com) – Influential Brands, a think-tank research and business organisation which identifies, engages and recognises “The Champions of Excellence” throughout Asia, has named and recognised nine Thai companies as deserving winners at the 2018 Thailand’s Outstanding Brands. The winners were judged not only on their outstanding success in its own category, industry or domain, but also on their significant growth in the past few years. Some of the key indicators used to assess the companies’ performance include – profitability, revenue, number of stores, number of employees, among others. From left to right: Mr Jorge Rodriquez, Managing Director of Influential Brands, Mr Chairat Sirivat, Deputy Chief of Mission of the Royal Thai Embassy to Singapore, Ms Vannee Leelavechbutr, Founder & CEO of Neo Target Company Limited, Ms Pavarisa Chumvigrand, Chief Marketing Officer of LINE Mobile Thailand Co. Ltd, Mrs Napasorn Pranich, CEO of SparSha Slimming Center, Mr Seah Kian Peng, CEO of NTUC Fairprice, Mr Somsak Mauthorn, Senior Executive Vice President of Siam Kubota Corporation Co. Ltd, Mr Piya Tantivachyanon, CEO of Superrich Currency Exchange (1965) Co. Ltd. This year, the nine top Thai companies winning the outstanding brands award ranged from food and beverage (F&B), fast moving consumer goods (FMCG) including agricultural machinery to financial services and online brands. Some of them have demonstrated sustainable double digit growth, continuous business development and integration of technology and innovation. Ms Vannee Leelavechbutr, Founder & Chief Executive Officer of Neo Target Company Limited, revealed that Neo Target will be the co-organiser of the inaugural Influential Brands Awards for companies in Thailand which will be held in Bangkok on 11 December. “In response to this latest trend in markets across Asia, Neo Target hopes to raise awareness among Thai entrepreneurs and owners of Thai brands of the significance of organisational reputation management as well as the importance of improving brand acceptance and trust, in order to enhance their business growth and ensure their competitiveness both at national and international levels,” said Ms Leelavechbutr. Line Mobile – Without doubt, this is one of the fastest growing brands in the telecom industry. Recognised as the first and leading 100% digital mobile service provider in Thailand, Line Mobile disrupts the market by completely shifting consumer behaviour from offline to online. Keeping consumer centricity in mind, Line Mobile focuses on turning consumer frustrations from traditional mobile services into delightful user experience. With Line Mobile SIM, consumers can simply call, chat, and enjoy internet surfing at a cheaper rate than any competitor. In less than a year, Line Mobile has achieved phenomenal sales growth of over 250%. Siam Kubota – The market leader of machinery solutions for agricultural industry and commanding a market share of almost 80% in Thailand, Siam Kubota is now recognised as the company for its vision of “Agricultural Innovation For The Future”. As an agricultural solutions provider in ASEAN, the company focuses on products and services development. It incorporates agricultural knowledge and experience with cutting-edge technology to sustainably enhance farming efficiency and thus contributing to the stability of Thailand’s agricultural sector, as well as to ensure food security for the global population. Superrich Currency Exchange (1965) – Established since 1965, SuperRich is the best-known currency exchange service in Thailand. Recognising the ever-growing tourism industry, the company offers a more convenient option with more favourable rates and more accessible locations compared to other competitors. As of today, SuperRich has over 40 outlets throughout Bangkok and they transact more than 34 currencies, serving up to 1 million customers per month. The company is also preparing to expand to other ASEAN countries and Europe in the near future. SparSha – SparSha Slimming Center is a well-known brand in the beauty industry of Thailand. Operating for more than a decade, the company has earned the love and trust of its customers with its high-quality products and services. Its steady growth allows SparSha to establish over 40 centers situated in various department stores across the country. SparSha stands out for its innovation and technology, harnessing them to develop and introduce new products and services to continually delight its customers. The 2018 CEO Asia Summit culminated in the presentation of Asia’s most-coveted “Top Influential Brands”, “Outstanding Brands”, “Hall of Fame” and the highly anticipated announcement of the winners in the new category of “Top Employer Brands”. Influential Brands is a think-tank, research and brand recognition platform formed to identify, engage and recognise the best brands throughout Asia. Its family of brands comprises global and regional brands from over 15 countries worldwide. Leveraging on more than 19 years of branding knowledge, know-how and expertise in Asia, it seeks to provide knowledge, raise awareness of desirable brands, and celebrate the unique aspects of Asian-based businesses and Asia’s rich brand heritage. Brand excellence is celebrated following extensive consumer and market research, assessment of branding qualities, influence and impact on consumers. Influential Brands strives towards “Champion of Excellence”.